Split-leaf philodendron (Philodendron bipinnatifidum), also called cut-leaf or tree philodendron, is a tough shrub that will grow outdoors in some parts of the U.S. despite coming from the tropical rainforests of Paraguay and Brazil. One of more than 200 other species of philodendrons, split-leaf philodendron has deep lobes in the leaves, leading to the name split-leaf. Some varieties have holes in the leaves. 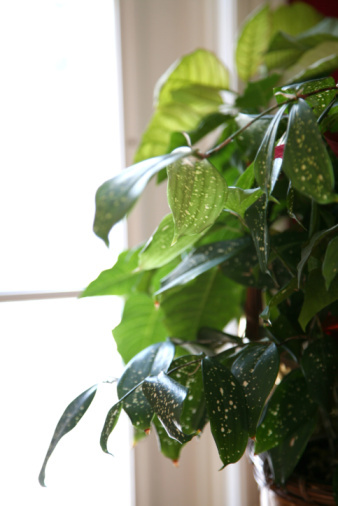 Leaf colors in split-leaf philodendrons vary from solid green to green with yellow markings. 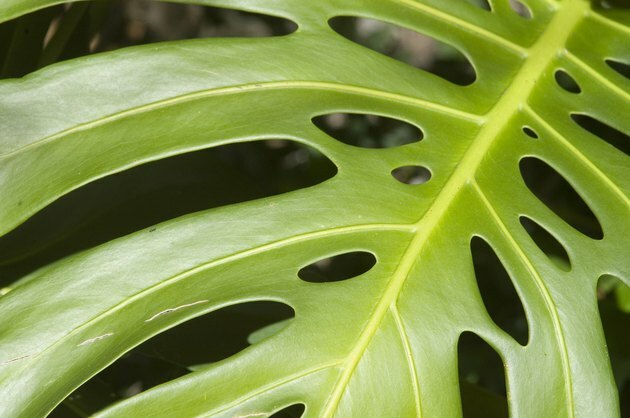 Close-up of a split-leaf philodendron. Split-leaf philodendron will generally grow outdoors in U.S. Department of Agriculture plant hardiness zones 9 through 11. The hardiness zones is not a guarantee your plant will survive an unusually severe or prolonged frost in your area or a heat wave. But if your philodendron is established and has been growing in its spot outdoors for a few years, it may come back the next season even if the extreme temperatures have killed all the branches. Split-leaf philodendron doesn't do well with direct sunlight all day, but it does need partial sun, with shade at midday in warm climates. If you provide the right light and regular watering, at least once a week, your plant will thrive outdoors. The plant also needs rich and well-draining soil and does best when you give it a granular 10-10-10 fertilizer, sprinkled around the philodendron every four to six weeks, using about 1 cup for each 100 square feet of soil. Because a split-leaf philodendron grows up to 15 feet tall and wide, you need an outdoor space or outdoor container that will accommodate the plant when it's fully grown. Once the plant reaches maturity, it has a tendency for the stems to flop over as well, so plant it away from walkways. If your plant gets too big for its space, you can also cut it back to within inches from the ground and new stems will grow. All philodendrons are toxic to people and pets if the leaves are eaten because the leaves contain a toxic chemical called calcium oxalate which causes inflammation in the mouth and throat. The stems of the plant contain a sap that irritates people with sensitive skin, so wear gloves and long sleeves when trimming the plant. Disinfect pruning tools by spraying them with an aerosol household disinfectant between plants.